The full run of the International Times has been archived online. 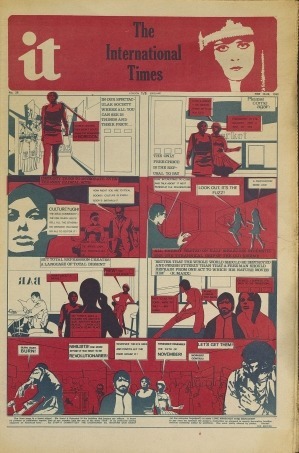 The International Times (it or IT) was an underground paper started in 1966 in the UK, based in central London. Editors and writers included founders John Hopkins (Hoppy), Barry Miles and Jim Haynes. ITs first editor was the recently deceased playwright Tom McGrath. Singer of the Deviants Mick Farren, Jack Moore and avant-garde writer Bill Levy were closely involved. The name International Times was changed to just “it” for a time after objections from The Times newspaper. However, it was anyway generally referred to by the letters “I-T”. This entry was posted in subversion, underground on May 26, 2009 by jahsonic.